If your horse gets too far behind the vertical, he ends up in a position that I call “rolled over the bit”. In that position, he physically can’t shift the parallelogram of his body. He won’t be able to bring his hind legs underneath his body and come up in front. So, you’ll have to help him by placing the bit out in front of him. out in front of him. One way to understand what I mean by “fluffing” the bit is to think about putting a sheet on your bed. You’ve just washed your sheets, and you’re going to make your bed. Both of your hands lift the sheet up in the air. Then, your hands gently come down so the sheet softly floats onto the bed. You’ll have this “put the sheet on the bed” feeling when you place the bit out in front of your horse. Lift your hands up and forward a little bit. Then, let them float right back down into normal riding position. Don’t hold your hands up in the air. If you do, your horse is going to curl his neck in even more. 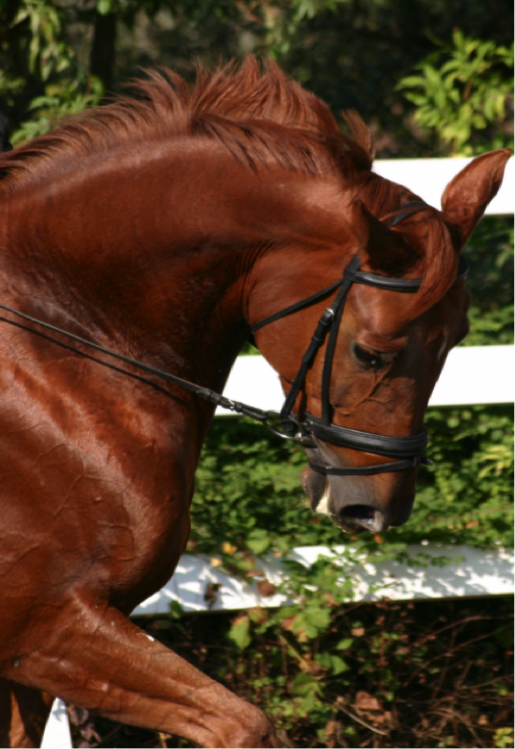 What Else Should You Know About Placing The Bit Out In Front Of Your Horse? First, NEVER lift your hands until you’ve closed your legs and asked for the feeling of a lengthening. Think of it as asking for the lengthening first. Then, follow up with “putting the sheet on your bed”. Another way to think about this action of your hands is to imagine people at a football game doing “the wave”. Their arms go up, and then their arms smoothly drift down. Just remember that if you have to place the bit out in front of your horse, put your hands forward toward your horse’s ears to the same degree that you lift them. If you just bring your hands straight up, your horse is going to tuck his chin in even more. To sum up, if you raise your hands two inches, then your hands also have to go two inches toward your horse’s ears. If you raise them four inches, place them four inches toward your horse’s ears. Then be sure that you maintain rein contact as you settle your hands back down into the work area. If you let the reins get loose, you’re going to bump your horse in the mouth when you take the contact back again. So, do the wave very elastically, and then bring your hands down. But keep a contact with the bit during the entire time. Also pick up both hands evenly. Lifting just one hand might cause your horse to tip his head. I’m reading The Happiness Advantage, and a main principle is that behaviors done happily are more effective and successful. Changing my thoughts to “I get to do this” is a fast and easy way to change my mindset to proceed happily. Thank you! A very good description. Thank you. Thank you! You must have known I was having trouble with this!! I will use your advice tomorrow.